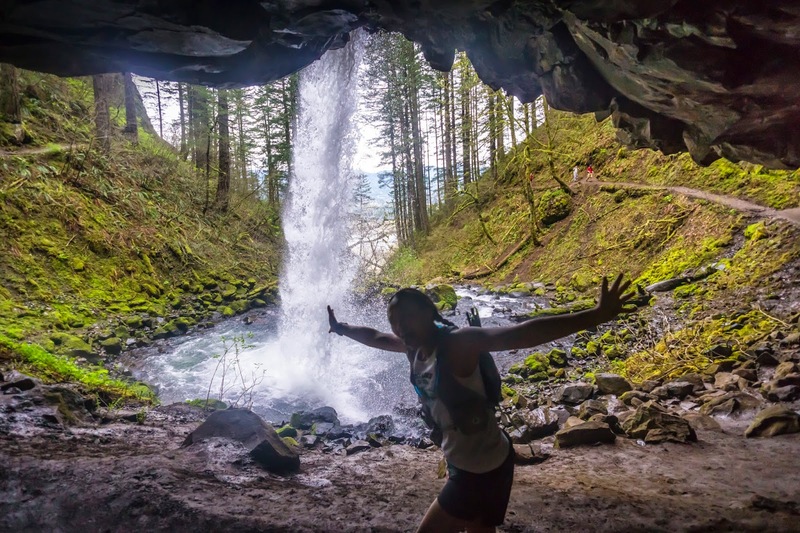 Thank you Jack Jewell for taking this picture of me during the 50K under the Ponytail Falls! Last year when I completed the inaugural 100K, I decided I wanted to come back and do the double. I am glad the races were reversed. Last year, the 100K was on Sunday. Arrived Friday morning after another crazy busy week at work. Can't say I felt rested but what could I do? I met Tracy Brown for a very early dinner at 3:30 pm at the pasta restaurant in Troutdale. We each retired to our rooms by 4 pm. I spent the next 1-2 hours rearranging the drop bags that I had already put together at home. I got into bed at 6 pm but couldn't really get to sleep. I probably got around 3 hours of sleep before getting up to head to the early start. Tracy picked me up at 1:50 am. We checked in, put our drop bags in the appropriate piles, and walked around nervously for the start of the race. There were a decent amount of early starters. Last year I ran the race in 14:30 but I knew my fitness was not as great, so I felt I needed the early start, especially with the double. I took it out very conservatively. It is very technical in those first 6-7 miles and dangerous in the dark. I wanted to pace myself for all the miles to come for the entire weekend. I was really enjoying the relaxed pace. Then, after the first aid station and going under Ponytail Falls, I took a wrong turn and descended half a mile down to the road. I realized I had gotten off trail and looked up to see all the runners going straight where I had descended. I made the rookie mistake of letting my adrenaline push me up that hill to get back on track and I paid for it much later. As the day wore on, my legs kept getting tighter and tighter. I found that taking salt helped, but I had been burned before when I took too much salt, so I tried to keep it in check. It was not fluids because I was peeing just fine. I finally made it to the turn around just under 8 hours, about an hour slower than last year. My relaxed pace now put the pressure on to make the cut offs. I moved as well as I could and did make the cut offs by over 10 minutes. As I got closer to the end, I started to take more salt, thinking I wouldn't do too much harm with less miles to go. This helped me continue a decent enough pace to make it in just as it was getting dark. Although it took me over 2 hours more than last year, I finished without any cramping at the end. I got dressed and Tracy drove me to get some food. Unfortunately, her hip was bothering her and she had to stop at around 50 miles. Thanks for getting me back to my hotel room Tracy! That night, I had to eat small amounts at a time because eating a lot made me nauseous. I had that deep, abyss feeling in my stomach all night. That terrible hunger pain and super tight plantar fascia kept me from getting the rest I needed for the next day's run. I think I got all of 3 hours of sleep. Woke up at 5 am to get ready for the 50K. I probably could have slept in more, but I needed to vacate my room and load my car. I stopped by McDonald's and got a chocolate milk shake. That did wonders for my calorie deficit and I felt much better by the time I checked in. The bus ride was fun to Wyeth. I talked to Justin Carpenito. We talked about what we had done this year so far and what is next. The weather for the 100K was good, a little humid for me but good. The 50K weather was really nice, too. Thank goodness for no rain! I lined up at the back of the pack. I got a lot of surprised looks from people who saw me running the day before. I started out super easy but my heart rate was jacked up for about 5 miles. After that, I felt amazingly good. I stayed on top of my salt and drank enough to make sure I was peeing. It was challenging to get a lot of calories in but I consumed enough to get me through the tough climbs and technical sections. I was worried that I was not going to be able to make the cut offs, but with each aid station, I developed a bigger cushion. I felt good until about 20-21 miles but running that entire section of road after Yeon did me in. By then, I was having a hard time swallowing my salt pills so I tried to eat salty foods. But I had also gotten behind on my drinking and my mouth was pretty dry. I decided to take it easy until the end because this was where it got very pretty. The final climb after the last aid station trashed my hamstrings. The last 3.5 miles has some extremely rocky and wet sections on a steep descent and that trashed my quads. I had carried my Z-poles the first 25 miles and was glad I had them for the last 6 miles. I arrived at Multnomah Falls to see Gretchen Walla directing runners under the bridge. It was great to see her face again at this part of the run. She was there also in the 100K cheering runners in. By now, I had to shorten my stride because I was cramping. But I saw that if I picked up the pace a little, I could come under 8 hours. I hate it when I put that kind of pressure on myself. It's not like I was going to win a special award or anything, so why push? I guess it's just in my nature. That last section of grassy trail along the freeway is interminable. I kept looking ahead to the runner in front, who was leaving me behind in a quick way, to make that final left hand turn. Then I knew it was a short jaunt across the foot bridge and the finish line is in sight. I came in at 7:58, threw my poles into the air, and got my finish hug from James. I also got a nice cheer from the crowd. I expected that place to be empty by the time I finished, but everyone was still hanging around eating pizza and drinking beer. It was such a party atmosphere! Someone brought me a coke (thanks man), and I said hi to a few people, but then I had to walk away from the crowd and keep my muscles moving before they tightened up and cramped. I was able to change and get something to eat. It took about an hour or more for my muscles to calm down enough for me to get in my car and drive the short distance to my hotel. But the ride was pretty uncomfortable and being bunched up in my little car was rough. I had planned on driving home that night but decided I better stay one more night or risk falling asleep at the wheel. I had a nice dinner with some California runners before heading to my room around 6 pm, showering, and getting into bed. My muscles still were angry at me and did not let me sleep until midnight after I replenished more salt and fluids. Thanks Rainshadow Running and all the volunteers for all your hard work and encouragement! I could not have made the tight cut offs in the 100K and finish the 50K with an hour to spare without you!